Aaron Neuwirth reviews Missing Link, the fifth stop-motion animated feature from Laika, which deals with the legendary Bigfoot, and other fun. Laika is great with combining dry humor and visual wonder. The stop-motion animation studio has produced films about alternate dimensions, zombies, underground creatures, and Japanese mysticism, which all build fantastical worlds around relatable characters who accept and move along with these wild developments. Missing Link is not too different, as it even opens with a well-dressed explorer passively taking on the Loch Ness Monster. Moreover, once the film gets in gear, it becomes a road trip movie about unlikely friends taking on adventures as they come. There’s silliness to be found, but the attitude feels so distinct for the studio. The film stars Hugh Jackman as Sir Lionel Frost, a myths and monsters investigator who has spent much of his adult life attempting to gain higher status amongst his peers, who have achieved success by sticking with the old ways of doing and accepting things. When Lionel receives a message concerning the legendary Bigfoot, he sets off to the Pacific Northwest to find the creature. As it turns out, Bigfoot (or Mr. Link, as Lionel dubs him) does exist and is voiced with proper naivety by Zach Galifianakis. The two make a deal to travel together to prove the small-minded explorers wrong, as well as connect Mr. Link to his proper brethren. At five movies in, I am happy to count on Laika to deliver several great elements – story, character, visuals, and themes. Director/writer Chris Butler (ParaNorman) had a distinct vision in mind for Missing Link, but it’s not too different from previous Laika productions. There is a clever story being told, which relies on a partnership and how their dynamic builds a solid foundation for a fun relationship between the two. And then you have the themes, which are generally rooted in sociological observations. It’s quite fitting to have an anthropologist being the one to realize he’s working too hard to be accepted by gatekeepers into their old boys’ club. Perhaps this element isn’t as sharp as some of Laika’s previous features, but Missing Link is looser than those other films. With the lack of a child as the lead character this time around, Missing Link provides Laika the opportunity to make their first “adult” comedy. That’s not to say there is a limit on slapstick humor, sight gags, and funny banter. 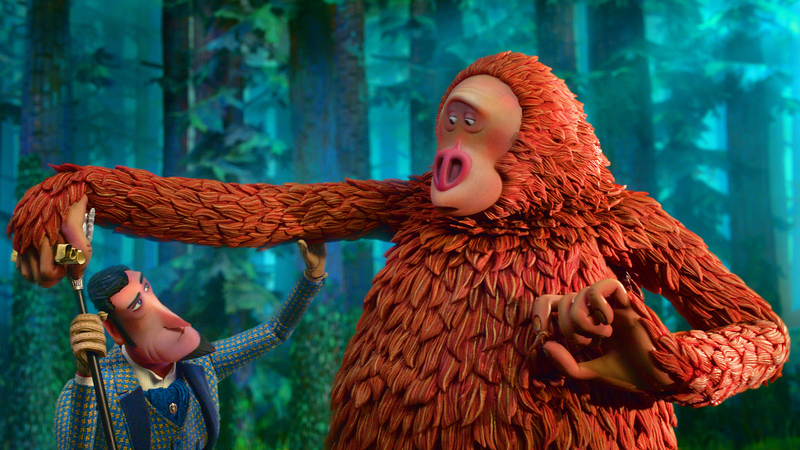 If anything, Missing Link may be the studio’s funniest film on the jokes-per-minute scale. Really, by having a focus on adult characters, the film has less of a need to provide complex moralizing that has been expertly infused within a story fit for a younger audience. Sure, some lessons are learned, and the film is sweet and distinct enough to still work for all ages, but fewer steps with Jackman’s initially self-centered Lionel are genuinely needed to understand the message. 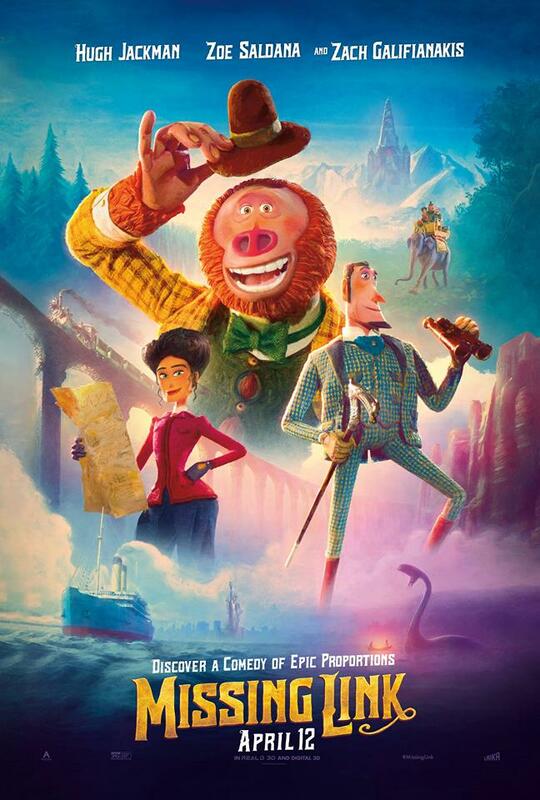 Instead, Missing Link works hardest to serve as a fun adventure story about outsiders, which eventually includes Zoe Saldana’s Adelina Fortnight, a free-spirit who’s handy in a fight, and likely the smartest of the three. As a travelogue, Laika’s biggest animation challenge this time around seems to have been developing so many different locations. Set during the Victorian era, you have detailed urban environments, along with forests, jungles, snowy mountains, and more. It’s a visual feat so grand that a shot of the trio riding an elephant is as impressively big as it is merely a way to move characters from one scene to the next. For all the animation innovation the studio has relied on, I never stop thinking about all the time that goes into crafting these various sequences. Keeping the visual focus in mind, Mr. Link is another stunning creation. His fur has the appearance of leaves draped over a massive body in a film very much holding onto an autumnal aesthetic (which is shared with most of Laika’s films). Even the clothing Mr. Link wears has a fun way of fitting on the character. Given how all of the Victorian era costumes for these uniquely sized and shaped characters are hand-crafted, I see no reason why Missing Link would not be just as eligible for a Best Costume Design Oscar nomination as any other period film that arrives this year. Regardless, in creating a memorable character, the look has indeed been accomplished. Matching performance to that look is another matter. Imbued with a literal-minded (but not dim) personality, Mr. Link comes across as a much friendlier Drax from the Guardians of the Galaxy movies. The visual of this Bigfoot character is impressive, but his reactions to the world around him, especially once he comes out of his forest, speaks to the childlike wonder many could have in exploring new areas for the first time. Fittingly, Jackson’s ability as a great…showman works as a fine counter. Not unlike P.T. 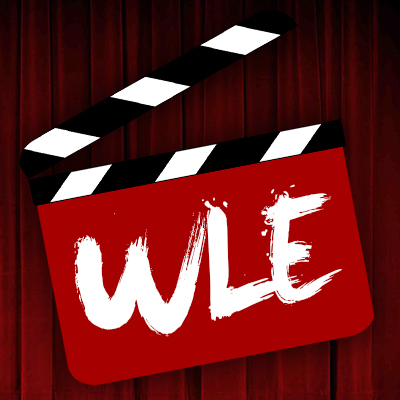 Barnum or Robert Angier from The Prestige, Jackman finds the right notes to play as far as being both fascinated by what he sees before his eyes and clever enough to talk his way through exciting scenarios and incidents. Other actors share in the delight of what this film has to offer in their own ways. Saldana does what’s needed to relate to Mr. Link, while begrudgingly allowing Lionel to move forward in his headstrong ways. 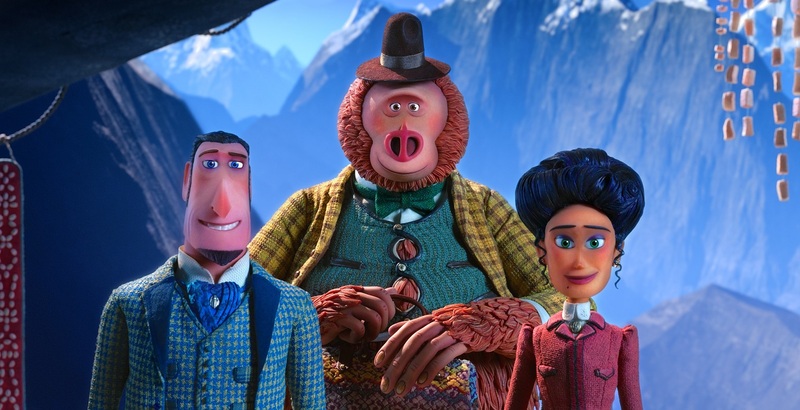 Stephen Fry is the latest aristocratic bully in a Laika film, making ridiculous choices with too much confidence, with the right animations to emphasize these qualities. Emma Thompson shows up in a neat revel and plays up the drollness of her character to a hilarious degree. And Timothy Olyphant gets to have a lot of fun as an evil assassin whose principles are malleable. While not a heavily populated cast, Missing Link spends its time working as a fun character comedy full of imagination. It doesn’t come up short on goofiness either. While it has a nice story to tell as far as acceptance and breaking down walls placed up against a progressive culture, there is plenty of silliness to enjoy as well. Laika is not above having that kind of fun, but the studio does have a fine amount of control over what they bring to their craft. Missing Link is another wonderfully animated feature that places plenty of emphasis on the design work viewed on screen. It’s also hilarious, which is a good thing, as no one wants to hang around a sad bigfoot.